Shopping in supermarkets has become more complicated. People used to assume that the fresh bread at the bakery counter was the premium product and the sliced bread in bags on the bread aisle was inferior. Now, the bread at the bakery counter costs between 79p and 89p for an 800g loaf, while a loaf of Warburtons Seeded Batch on the bread aisle costs as much as £1.40. This is a sign of the pace of change in the bread market, according to Nick Townend, Category Manager for Bakery at Sainsbury's. "A number of people have launched new products," he says. "There's been quite a lot of innovation and some of that has been in the premium end of the market, but if you look at our Sainsbury's brand sliced loaf, that is still at the moment cheaper than our in-store bakery equivalent." Jonathan Warburton, chairman of Warburtons bakery claims credit for proving that price was not everything when he launched his seeded batch loaf six years ago priced at more than £1. "It completely blew out of the water any belief that the consumers would only buy bread if it was cheap and the reason it sold was down to the fact that it over-delivered on expectations," he says. It is all a long way from the bread price wars of the early 1990s, when supermarkets sold bread as a loss-leader, with some selling a loaf of sliced white for as little as 7p. Now, many branded standard sliced loaves cost more than £1. The Office for National Statistics (ONS) has been collecting the price of a standard 800g loaf of sliced white bread as part of its basket of goods for measuring inflation since January 1993. During the first decade when they collected the figures, the average price only rose by 2p. Then, between January 2003 and January 2007 they rose by another 27p, as rising wheat prices and energy prices squeezed bakers and innovation allowed the big brands to charge premium prices. The innovation in sliced-bread is not necessarily bad news for the in-store bakeries. "If we could crack how to do their bit and give it a longer shelf-life, or if they could crack how to do our bit in the in-store bakeries, we'd both have problems, but at the moment the split of 80/20 of market share remains," Mr Warburton says. "There's a role for both types of bread and what we're able to do in in-store bakeries is produce absolute freshness - something that's only a couple of hours old when a customer buys it - whereas I guess what busy mums are looking for when they're buying sliced bread is a product that does have four or five days life," according to Nick Townend at Sainsbury's. After experimenting with various methods of part-baking and pre-mixing dough, Sainsbury's has now returned to baking bread from scratch in 360 of its in-store bakeries, although the smaller bakeries in its Central and Local stores still use part-baked dough. 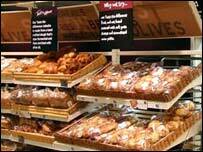 In stores where the bread is baked from scratch, 40% of the bread sold comes from the in-store bakery. It was the appetising smell of baking bread that was supposed to entice us all into the supermarkets when they were in their infancy. 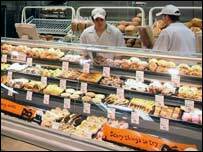 Listening to Mr Townend's assessment of why his customers like in-store bakeries, it is clear why they survive even when plant bakers such as Hovis, Kingsmill and Warburtons can charge higher prices than the supposedly premium, fresh crusty bread. "They really savour that experience from the in-store bakery where they can smell the loaves being prepared," he says. "You'll have seen yourself when people go and pick up a loaf and find it's still warm from the bakery, you can actually hear it when you squeeze the loaf and you get the crust crunching with your fingers. It's just the freshness of the product." Why is the price of bread important?